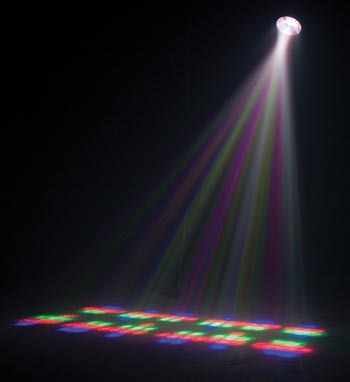 The latest LED powered lighting effect from American DJ, the LED Messenger, projects scrolling text messages onto walls ceilings or floors. Using 192 red, green and blue LEDs, the LED Messenger has 10 built-in phrases (Happy Birthday etc.) and can also store 5 user-programmable phrases of up to 30 characters each. A wireless remote control is included, but a standard PS-2 computer keyboard can also be connected for typing in custom phrases. The unit has a built-in microphone for sound activated operation and is also DMX compatible. Look out for a review of the LED Messenger in issue 30 of Pro Mobile.